In Religulous, Bill Maher was on a satirical quest to find God and understand religion while laughing at the extraordinary claims by the religious. The advertising guru, Simon Cole, took a completely different approach in his documentary film "So Help Me God." It’s not a comedy, but rather it is a drama – portraying a real spiritual quest to find God. Instead of laughing at the religious and what they say, he listened and asked questions trying to understand God. Going from one religion to another, from one denomination to another, he begins to realize that the question is not only where God is, but who’s God is the right one. Everyone is convinced their God is the one, but how can you truly believe it if there are so many religions in the world? It was delightful when occasional, genuine humor would distract you from the truth. While talking to Presbyterians about homosexuals one of the older guys, probably in his 70 said, "Don’t you love that all these fundamentalists quote the King James Version; and he was as queer as three dollar bill." You can’t help but laugh. If you want something refreshing, something personal, and powerful – watch "So Help Me God." As an atheist you will see religion from a different perspective and as a theist you will enjoy Simon’s search for God. It’s very healthy to search for the unknown as it takes courage, especially when the unknown defies the mainstream status quo. A personal master piece that will leave your mind in a deep thought contemplating about your own spiritual state of mind. You owe it to yourself to watch it. Read the original article here or watch «So Help Me God» trailer. Meditate and Destroy- Now on VOD! Meditate & Destroy is now accessible to viewers from the comfort of their homes or on the go exclusively via Alive Mind's Video On Demand service. Meditate and Destroy is an 81-minute documentary about punk rock, spirituality, and inner rebellion. The film focuses on the bestselling author of Dharma Punx and Against the Stream, Noah Levine. Tattoos, motorcycles, and Buddha are featured in this hard-hitting look at how Buddhism has a place in the world of punks. This inspiring film opens our perception to the possibilities of finding new paths- even in our darkest hours. 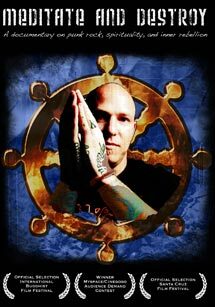 This film provides an up-close look at how the driving forces in Noah’s life changed from violence, addiction and rebellion to taking on the role of dedicated meditation teacher and community leader - an individual whose candor inspires others to integrate Buddhist teachings of nonviolence and inner peace with a Western lifestyle. Available to all U.S households or mobile devices with a high-speed Internet connection, Meditate & Destroy will inspire viewers to embrace the transformational power of Buddhism. I hope you enjoy this quirky, unconventional film. You might think you know what to expect of this film on the basis of the title. Yet, shoehorning So Help Me God into the category of spiritual documentaries would not be quite right, as the film is a highly personal story of exploration, brisk yet thought-provoking, not to mention visually captivating. Our protagonist is one Simon Cole, a well-off man, happily married and seemingly economically unburdened. Simon however carries a load he regretfully cannot drop off his shoulders--he greatly longs for a connection to God. This is a presence Simon does not have in his life and he is driven to at the very least understand it. As such, he strikes out on the journey that will be the subject of the documentary, done in collaboration with his two brothers Ben and Nigel Cole. With a background in commercials, the brothers bring a visually expressive eye to the proceedings, adding a new dimension of sight and sound that keeps the documentary from slipping into dry discussion. It helps that Simon is a personable and earnest interviewer who does not hesitate to bare his regrets and fears to the camera. The film also benefits from a variety of religious figureheads who share their opinions with a candid openness that echoes throughout the film. This is an honest attempt to explore one man’s religious conundrum, yet Simon personifies those of us who have questioned their faith or lack thereof. He is earnest and steadfast, a narrator without a shadowy agenda to ridicule or challenge the beliefs of those he encounters and questions. He is burdened by his dilemma and seeks an answer to it in any way he knows how. The final scenes of Simon isolating himself to the desert for some serious soul-searching are among the most emotionally affecting in the film – you can see the exhaustion and difficulty to cope transcribed on Simon’s face. So Help Me God is his story, and it is an exhilarating one. Back from Silver Docs, where Albert Maysles was awarded the 2009 Guggenheim Lifetime Achievement Award. A fun time was had by all at the after-party with Al, Christo, Jeanne-Claude and the entire Maysles team basking in the limelight and enjoying the champagne. Q. Why is it important that this story be told? A. My films always begin with something that is happening inside myself, but that I also see reflected in the world around me. I think people are starting to feel like they're coming to a dead end with the old models of creating change in the world, especially some of the forms of activism that are focused on what we're against, as opposed to what we're for, and that are anger-based. I definitely found that with myself, and so I discovered a new kind activism that has its roots in the attitudes of Ghandi and Martin Luther King Jr. You could call it compassionate activism or spiritual activism -- positive, celebrating life, and solution based.